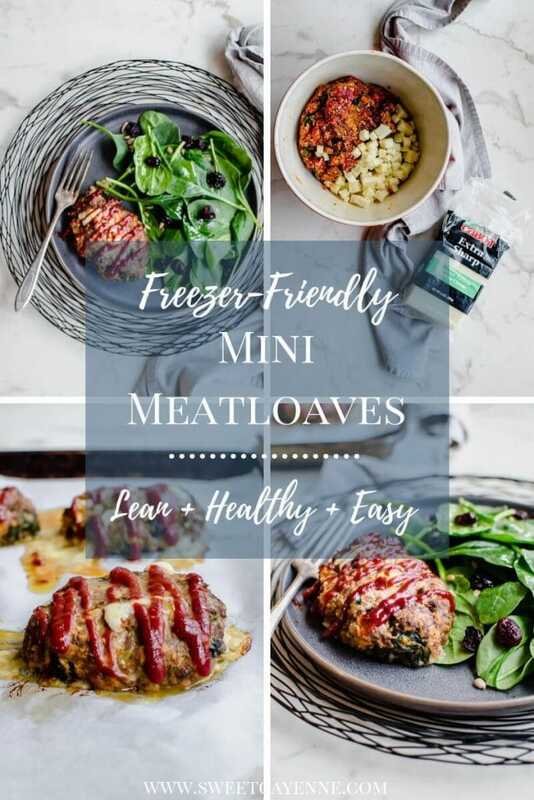 This easy recipe for freezer-friendly mini meatloaves can be made with any lean ground meat and made ahead – kids and kids at heart will love them! Welcome to the first recipe of 2019! How is the year treating you so far? I hadn’t planned on taking a 2-week break from blogging once the new year started, but as circumstances would have it, the time off from the internet was exactly what needed to happen. I’ve been struggling with a cold that has been getting better and getting worse on and off for the past month! That on top of holiday travels, coming home and packing away Christmas decor, and just reflecting on 2018/making plans for the new year made for a full two weeks off. I had to prioritize and give attention to what mattered most at the time, and I’m so glad I was able to pay attention to what my body, heart, and mind were telling me to do! I’m thinking we all could benefit from being a little kinder to ourselves at the start of a new year – keeping expectations low. doing lots of reflection, and getting tasks done that will set ourselves up for success later in the year. I’d love to hear your thoughts on this, so leave a comment below! So, let’s get back to talking FOOD! And perhaps makeover a comfort food classic while we are it? Right before the week of Christmas, I taught a cooking class on healthy recipes for game meats, and these individual meatloaves were one of the dishes I made for everyone! I’ve actually been making them for about 6 years now – they were a popular staple in my rotation for families when I was working as a personal chef. I’ve been making different versions of them over the years – changing out the meat, veggies, seasonings, etc, and have finally settled on a favorite. Growing up, meatloaf was not something my mom ever made. I had always heard comments about it being old-fashioned, dry, tough, etc. and was never really inspired to try it for myself. That all changed, however, when I tried a version at Breadwinners in Dallas (they still have it on the menu!). It was so tender and juicy, smothered in a smoky sauce, wrapped in bacon, and served with the creamiest mashed potatoes. I knew at that point that I had to try making it myself! 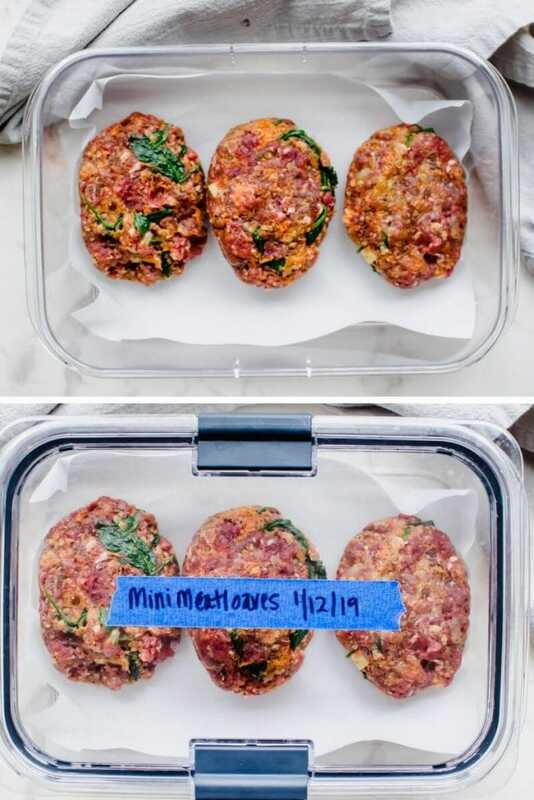 My starting point was the recipe for Cheesy Meatloaf Minis from Cooking Light – I loved the individual serving size and found that the smaller version kept the meat from drying out. And the little surprise nuggets of melted cheese were definitely a selling point for me! 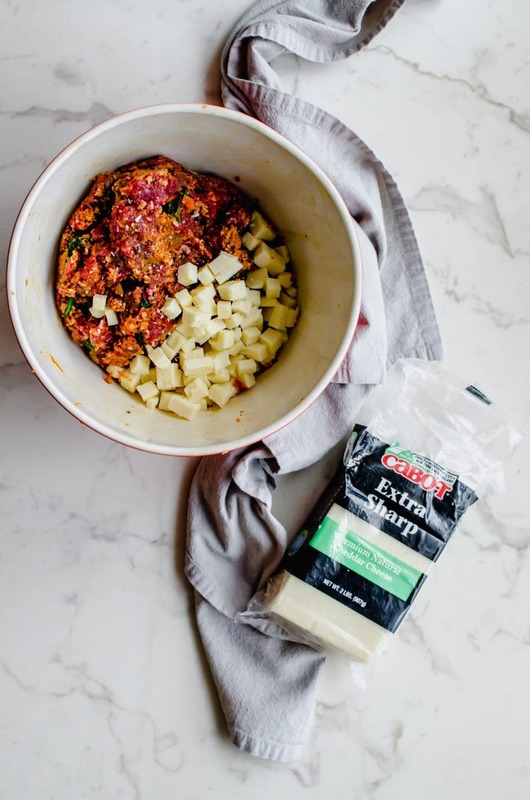 It’s a creative way to use up veggies – thinly-diced or finely-grated, pretty much any veggie you have that needs to be used up in your fridge can be used in a meatloaf! Carrots, squash, zucchini, spinach, kale, leeks, beets, onions, etc. are all good options! I love how the finely-grated carrot in my version lends moisture and sweetness to the meatloaves. And I always have baby spinach on hand that needs to be used! Mini, individual servings – so many benefits to this! Portion control, less cooking time, more surface area for caramelization, and less chance of overcooking, to name a few! Make-ahead and freezer friendly – you can make and shape this up to 1 day before baking them, and freeze unbaked for up to 6 months. Options = convenience! Check out my favorite freezer containers here! Perfect for meal prep – these reheat in the microwave exceptionally well, staying moist and tender. I like to pack them for lunch with a side salad, or some quinoa/couscous/farro and roasted veggies. Check out my favorite meal prep containers here! 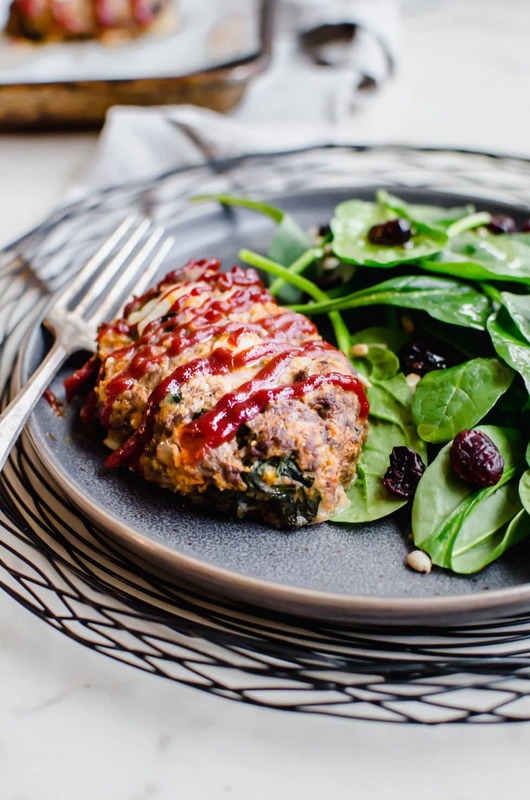 Use any lean ground meat – in the version I’m sharing with you today, the meatloaves are made with ground venison (deer meat). But I’ve made these before with 93/7 lean ground beef, ground turkey or chicken breast, or a mixture of lean beef + Italian chicken sausage. The moisture from the sauteed veggies and the use of Panko bread crumbs keeps the meat from drying out while cooking! 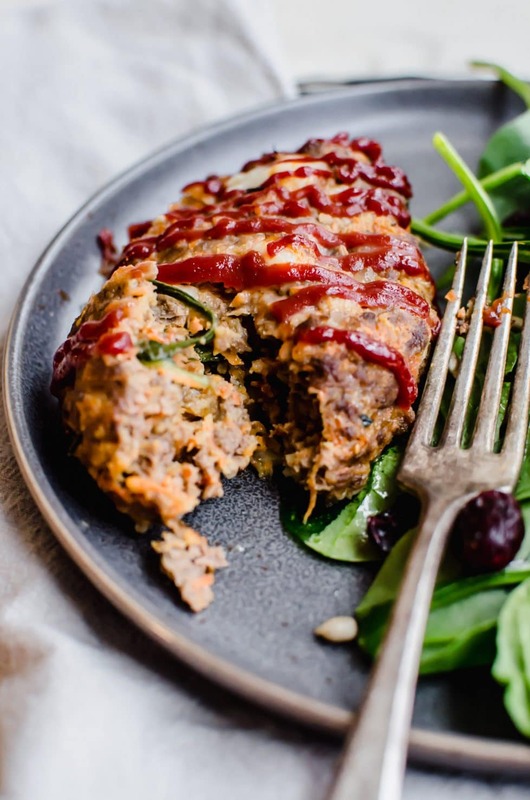 Friendly to the kids and kids-at-heart – because, who doesn’t like a surprise bite of gooey cheese hiding out in their meatloaf?!? White cheddar, pepper jack, mozzarella, blue cheese, and goat cheese are excellent options here! Mix all the veggies + seasonings together before adding your meat – doing this will ensure that everything gets mixed well and distributes evenly as you fold it into the meat. 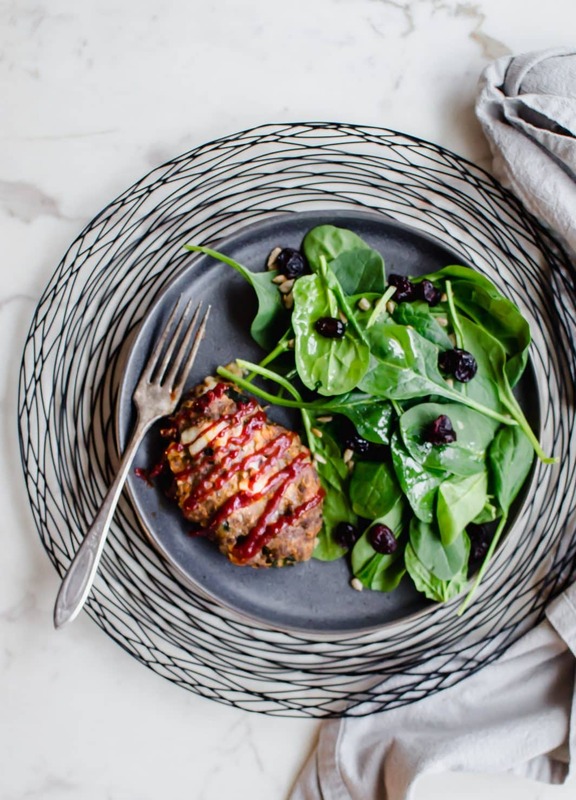 Use a light touch – any time you are using your hands to work with ground meat – whether it be shaping burgers, meatballs, or meatloaf, you want to handle the meat delicately with a light touch. Squeezing, pressing, kneading, or overhandling makes ground meat tough and rubbery once it’s cooked. So be delicate about things (hi Taylor!). Take the temperature – the best way to know when your meatloaves are perfectly cooked is to use a meat thermometer. I’ve got the optimal temperature listed out in the recipe below – it will vary depending on the type of meat you use. Simply insert the thermometer into the thickest part of the loaf and wait for the temperature reading to stabilize. Better to be safe than sorry! Freeze some for later – that’s the nice thing about fall/winter comfort food. A lot of it freezes well and you can stock up on yummy freezer meal for your next snow day! I love these containers from Rubbermaid Brilliance for freezing and fridge storage – they are airtight and keep all the flavor locked in! 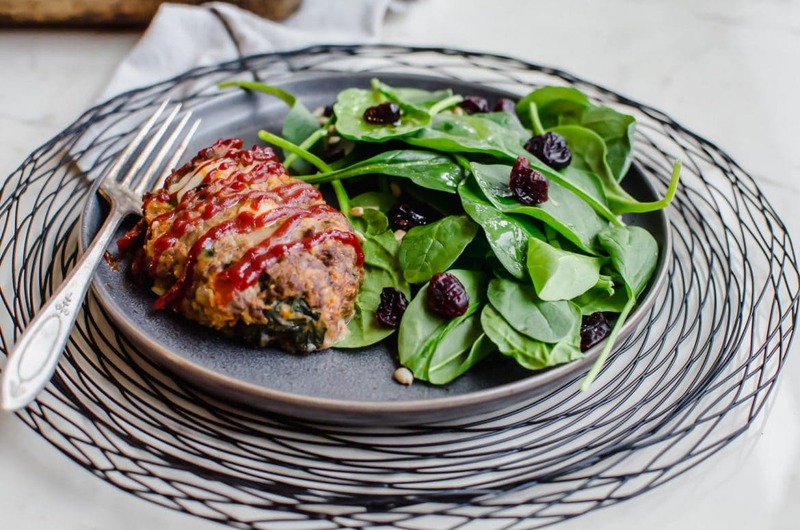 Are you ready to get make these freezer-friendly mini meatloaves? I’m so excited for you to try this recipe. Once you get the chance to make it, please let me know how it turns out for you! Leave a comment and rate the recipe below. This will help me with the creation of future recipes! I’d also love to feature your creation in my monthly newsletter, so you can upload a photo to Instagram or Twitter with the tag @sweetcayenne5 to be featured! As written, this recipe is low-carb, high-protein, and freezer-friendly, making it suitable for a wide variety of balanced, healthy eating patterns. 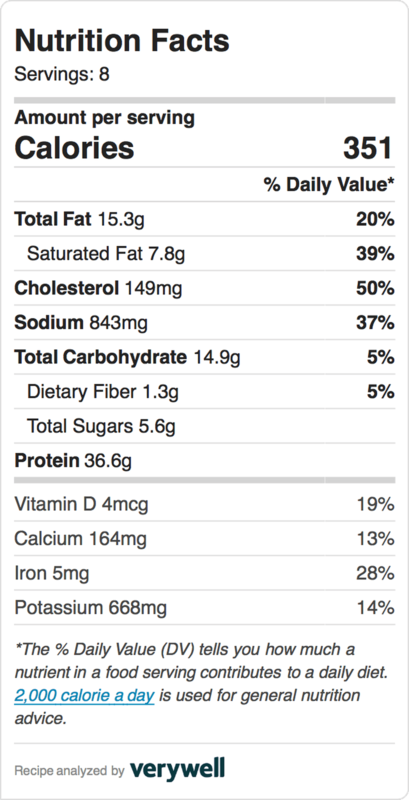 Preheat oven to 425℉ for beef, and 375℉ for venison, chicken or turkey. Line a baking sheet with parchment paper and set aside. Heat a large skillet over medium heat. Add oil to lightly coat the bottom of the skillet. Add the shallot and sauté for about 3 minutes or until softened and translucent. Add the carrot, spinach, and garlic, stirring to heat through and wilt the spinach, about 2 minutes. Remove from heat and cool slightly. Combine veggie mixture, breadcrumbs, egg, 1/4 cup ketchup (or other sauce), mustard, Worcestershire, and seasonings by whisking together until combined. Add the ground meat, and use a rubber spatula to lightly fold the mixture together. Fold the cheese cubes into the mixture, being careful not to overwork the meat. Use your hands to shape into 8 (4 x 2-inch) loaves, about 4 ounces each, and place on the prepared baking sheet. Drizzle about 2 teaspoons of ketchup (or other sauce) onto each loaf. Bake at 425° for 25 minutes for beef (it should reach an internal temperature of 155℉), and 30-35 minutes for venison, chicken, or turkey (it should reach an internal temperature of 165℉). Serve hot and enjoy! For freezing: Place the shaped individual loaves into an airtight container lined with parchment or wax paper. Place a sheet of paper between layers of loaves if you need to stack them. Freeze for up to 6 months. To thaw, place the container in the fridge overnight. Top with sauce and bake as directed. 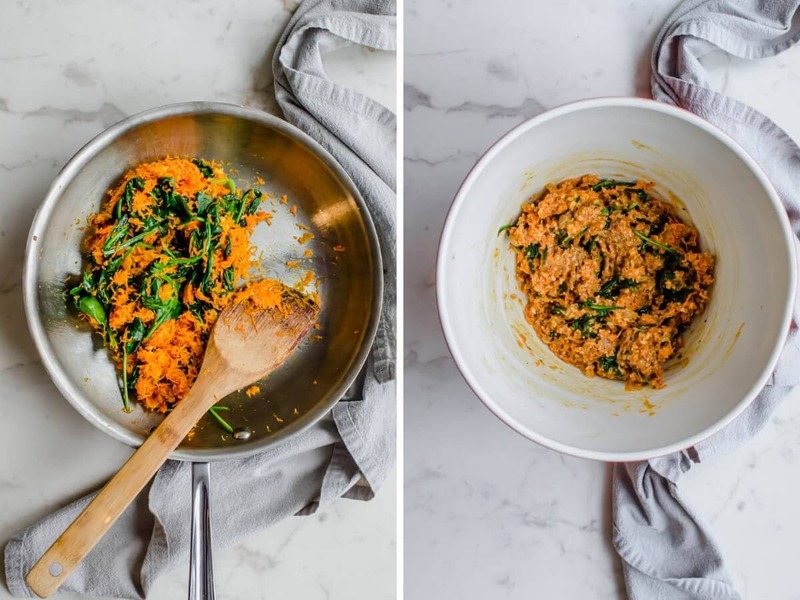 Previous Post: « Healthy In The New Year: Recipe Roundup!